Kishore Choudhary is a poet and fiction writer from Barmer (Rajasthan). His writing career took a formal leap from his personal journals to make him a hugely popular blogger on two of his blogs- Kahaniyan and Hathkadh. Having spent most of his formative years in the desert, the life there is his favourite canvas to contextualise his poetry and stories. His followers from across the world vouch for his realistic and authentic portrayal of the desert life and its typical dilemmas, fused beautifully and almost effortlessly with some stunning images of the desert and its folklore. Kishore in a way pioneered the incorporation of pre-publishing interactions and feedback with his readers on his blogs and across social media platforms in his final Kishore Choudhary is a poet and fiction writer from Barmer (Rajasthan). His writing career took a formal leap from his personal journals to make him a hugely popular blogger on two of his blogs- Kahaniyan and Hathkadh. Kishore in a way pioneered the incorporation of pre-publishing interactions and feedback with his readers on his blogs and across social media platforms in his final works. His style is known for its lucid and unexampled metaphors that he exquisitely uses to express universal feelings like love, loneliness, hope, pain, longing and fantasy. His first collection of stories Chaurahe Par Seedhiyan (2012)was such a thumping bestseller that the first issue was sold out within 50 days of its launch.All the stories skilfully bring the rich and exotic background of the desert come alive and make the reader delve deeper into the layers of human emotions.This much sought after collection raised the bar for all contemporary Hindi works of short fiction and brought in a fresh change in the existing status quo for Hindi short stories. The second collection titled Dhoop Ke Aaiyne Mein(2013)had an array of short stories that looked at life through a multi-dimensional prism, lending each one of them a distinctive charm. Kishore being a poet first, his stories are more like poetic fiction. Having a great affinity to the stream of consciousness novels by English literary greats like James Joyce and Virginia Woolf his stories defy the conventional rules of a definitive beginning, middle and end. Kishore’s first publication was a collection of poetry Baatein Bewajah, an alluring and bewitching series of short poems which capture the vast expanse of human emotions and have images that have a rare haunting quality. Kishore is a Radio Broadcaster by profession and has a special fondness for classical & folk music. Articles about him and his interviews are available across many major newspapers and websites. Kishore certainly is the Avant-garde flavour in contemporary Hindi writing and his ever expanding avid readership eagerly waits for his next chartbuster. Kishore's latest is another collection called "Jaadu Bhari Ladki". This collection has his same imitable style of stories but the contexts and places are beyond the desert as well. Kishore Chaudhary isn't a Goodreads Author (yet), but they do have a blog, so here are some recent posts imported from their feed. मैंने पूछा- "कुछ याद आई?" आभा ने कहा "हाँ आपकी दोसत। उनकी कया ख़बर है?" 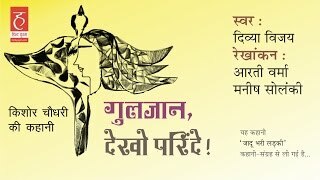 मैंने कहा- "पता नहीं। कहीं रंग भरी अंगुलियाँ लिए डराइंग बोरड के सामने खड़ी होगी या किसी आरट गेलेरी में अपनी पेंटिंगस बेच रही होगी।"
Is this you? Let us know. If not, help out and invite Kishore to Goodreads.